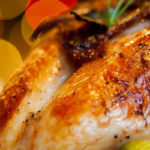 It’s no secret that store guests of United Supermarkets, Market Street, Amigos, Albertsons Market and United Express are exceedingly loyal to “their store”. In fact, it’s one of the things we love and take the most pride in. It’s hard not to feel proud when you hear a guest talk about how great their store is. Reaching far back in the annals of United Family history, we find a story of one guest in Littlefield who would turn out to be successful. Mrs. J.B. Campbell wrote a letter in November 1972 encouraging United to come to Littlefield. Just as Jack Snell did back in 1972 in a letter from Mrs. Campbell, to this day we hear from wonderful folks all the time who would dearly love for us to put a store in their city, town or suburb. Your letter of November 22, regarding our locating in Littlefield, was greatly appreciated, and we consider it a compliment. We have surveyed Littlefield in the past, and negotiated on a location there about three or four years ago, but it never materialized. Since that time Piggly Wiggly has closed and this would enhance our changes of locating there presently. To be perfectly honest, the population in this area is not enough to support two major stores. However, we will give the matter new consideration, and please know we appreciate your interest in our company. While we can’t always accommodate right away (just ask Seminole residents right?!) never say never! 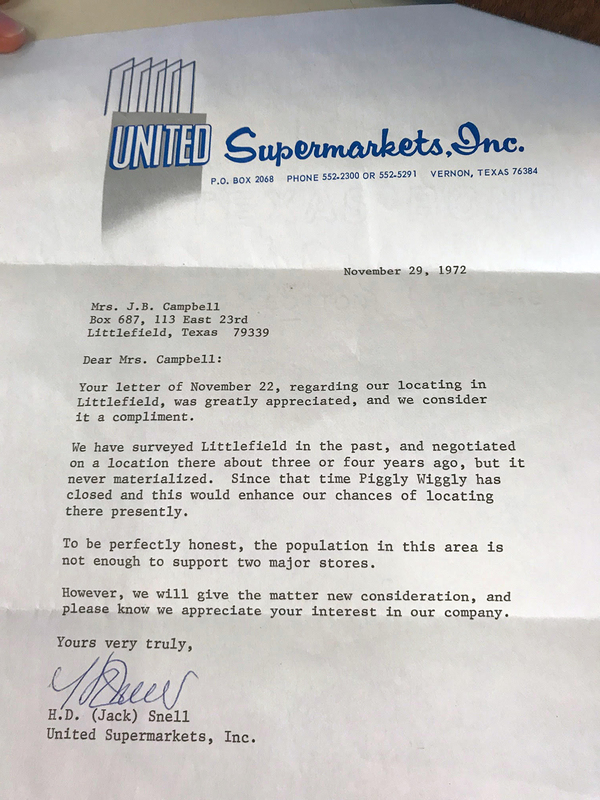 Just 5 short years after this letter was written, United Supermarkets Littlefield opened their doors and is a thriving part of that community today. We’re a transient society now and people move all the time. As guests move out of a United Family city, they take a little bit of the spirit of United with them. We hear from them a lot in cities we aren’t in yet with messages of how much they miss their store. Make no mistake, we miss you too! Where do you think the spirit of United might take us next? Wherever it is, be sure that those future guests will embrace the spirit of Ultimate Service, Superior Performance and Positive Impact with open arms. 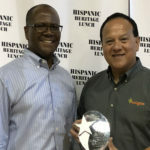 Q: Where did United Supermarkets first open their doors in Texas? Q: Where was the first Market Street? Q: Where was the first United Supermarkets built from the ground up? A: Store #500 in Lubbock, Texas was the first store built from the ground up. It was destroyed in the May 11, 1970 tornado that devastated much of the city. Q: Where is the only Albertsons Market store currently operating that The United Family opened from new construction? Q: What’s next for The United Family? A: We don’t know yet, but we’re excited to write that chapter with you!